If you have a spare day, the weather is nice and you feel like taking a quick dip into Bulgaria's history, while also making it back to Sofia in time for dinner, you may consider spending a day in Lovech and Troyan. The two towns are about 160 kilometres east of Sofia and are home to fortress ruins and a monastery, some of the most picturesque in Bulgaria. Neither of the two sites is large enough to captivate one's attention for a whole day, but their close proximity to each other makes the combination of Hissarya fortress in Lovech and the Troyan monastery a pretty good day out. Although the fortress of Hissarya is not the biggest in Bulgaria, its ruins come close to rivaling those in Veliko Tarnovo. Built in the 9th and 10th centuries, it can be reached only from the east, being protected by the river Osam and unassailable rocks from the other sides. The fortress was one of Bulgaria's most important defensive fortifications and is the place where the Bulgarian insurrection led by the brothers Assen and Peter won independence from the Byzantine emperors. 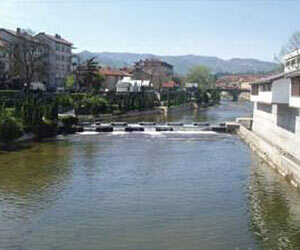 By the 14th century it became one of the biggest and most important towns of the Bulgarian kingdom. Although the kingdom was doomed when facing the Ottoman invasion, the fortress was one of the last to fall and its ruins still bear witness to the wrath of the conquerors. Less than an hours drive to the south, the Troyan monastery is one of the locations closely associated to Bulgaria's drive to win independence from the Ottomans in the 19th century. The monastery's beginnings lie in the late 16th century, when, according to legend, three monks from Mount Athos brought to Troyan a copy of a miracle-working icon of the Virgin Mary. The icon remains the monastery's prized possession to this day. The monastery in Troyan is Bulgaria's third largest, but its importance grew steadily after 1830, when it was awarded complete autonomy from the Bulgarian ecclesiastic establishment, becoming directly subordinated to the Patriarch of Constantinople. The monastery's buildings were raised over several decades and some of the internal paintings were done by the famous Bulgarian artist, Zahariy Zograf. The monastery is closely associated with the independence drive in the second half of the 19th century and even served as one of the main hiding places for Vassil Levski, the main ideologue of Bulgaria's fight for independence. And last, but not least, sit down to try the local cuisine and the local plum brandy - both are among the best in Bulgaria.